Did you know that workers' compensation laws were originally passed for the protection of the employer? It's true. Employers were being sued by employees for unsafe working conditions and co-employees were suing each other for negligence. The money damages were too great for employers so they sought protection from their lawmakers. As a result, workers' compensation was created with the idea that everyone would recover some amount for injuries in the workplace but the amount of recovery would be controlled. Thus, workers' compensation laws put in place caps on employer liability and provided injured workers immediate - yet reduced - benefits and eliminated the need to prove negligence or fault. What is the most important thing I can do to protect myself with regard to a workers' compensation claim? Does it matter if the accident was really my own fault? My employer told me he doesn't have insurance. Now what? I heard that workers' compensation benefits are not too good, so if I want to sue someone, can I? My employer has a mandatory program to test for drugs and alcohol after every work related accident. Will it effect my workers' compensation claim if I refuse to undergo this testing? I was hired in Kansas but injured in Missouri. Can I claim benefits in both States? I only worked for this employer for two days, and I do not want to work there anymore. Am I covered? The company where I worked and got hurt went out of business. Now what? What are the first things I should do if I am hurt? If my employer tells me I do not need to see a doctor, what do I do? My employer sent me to a doctor. He does not seem to be helping me and we do not get along. Can I do anything? Is chiropractic care covered by workers' compensation? What should I do when I see the doctor? My doctor has given me a "rating". What does that mean? I have been "rated and released." Can I ever have more medical treatment? What are the main benefits under workers' compensation? When and what kind of payment can I expect? Since workers' compensation only provides limited benefits, are there other disability programs that might provide me payments if I am unable to work? I am working two jobs. Due to my injury, I can no longer work at the job where I was injured. I am receiving temporary total disability checks. Can I still work at my other job? I have heard that my wage is important. Is it? I have been hired out of the union hall. What fringe benefits apply for workers' compensation? What is the right to Review & Modification? I hurt myself before in the same location. How does that affect me? My doctor told me my condition was caused by wear and tear from my work over the years. Is this still covered by workers' compensation? What if they keep saying they will pay me and pay my bills but it doesn't get done? Can I use the grievance procedure to get workers' compensation benefits? If my employer terminates me for filing a workers' compensation claim, what are my remedies? What if I get fired or mistreated after I return to work or after I file a workers' compensation claim? My doctor has suggested certain permanent restrictions due to my work related injuries. I am now looking for a different job. Do I have to disclose these permanent restrictions to potential new employers. My employer makes me work beyond my limitations. What can I do? What is a medical management process? Are they spying on me? Should I lump sum settle my case? My employer has offered me a lump sum settlement cutting off all rights under the Workers' Compensation Act. This will close off my right to payment of future medical treatment by the workers' compensation insurance carrier. Can I get my private insurance or Medicare to pay for my future medical needs? How much do attorneys cost? Is there anything that I can do to influence Kansas Workers' Compensation laws? I have read this material and have additional questions or need clarification about certain things. What should I do? The workers' compensation law was supposed to be a very simple method for handling these matters. Unfortunately, as with any other law, there are continuing changes in the law affecting procedures, burdens of proof and benefits available. As a result, workers' compensation, more now than ever, is very complex with its own set of rules and practices. 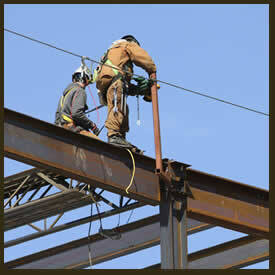 A major new workers' compensation law went into effect on May 15, 2011. Contact a Kansas work comp lawyer representing clients in Topeka, Kansas today to schedule your free initial consultation. This material is presented by the law firm of McCULLOUGH, WAREHEIM & LaBUNKER, P.A. in an effort to answer the most often asked questions about workers' compensation. They feel you should know your rights. The law firm of McCULLOUGH, WAREHEIM & LaBUNKER, P.A. is located in Topeka, Kansas and in Westwood, Kansas. The law firm has dedicated itself to representing injured workers and other individuals across the State for almost 60 years. It is hoped that this information provides some of the answers you are looking for. It should only be used as a guide to general situations. The law is always changing. For specific problems, you need to seek and obtain qualified advice. On behalf of McCULLOUGH, WAREHEIM & LaBUNKER, P.A. we hope this material will be of benefit to you in answering your questions relative to work-related injuries. This material is a part of an ongoing commitment by McCULLOUGH, WAREHEIM & LaBUNKER, P.A. to unions, their members, and injured workers in the State of Kansas.Contact one of our Kansas work injury lawyers representing clients in Wichita, Kansas (and throughout the State of Kansas) today to schedule your initial consultation. McCullough, Wareheim and LaBunker P.A. is on the southwest corner across from the Topeka Workforce Center on SW Topeka Blvd. Click the map above for directions. 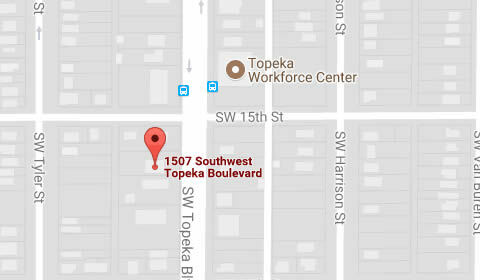 Our office is a block south of the Topeka Workforce Center on SW Topeka Blvd. Topeka, Kansas Attorney practicing in primarily in Workers' Compensation, Social Security Disability, Family Law & Personal Injury. Attorneys at McCullough, Wareheim & LaBunker, P.A. are dedicated to serving their clients in Kansas, including the cities of Wichita, Overland Park, Kansas City, Olathe, Topeka, Lawrence, Shawnee, Manhattan, Lenexa, Salina, Hutchinson, Leavenworth, Leawood, Dodge City, Garden City, Junction City, Emporia, Derby, Prairie Village, Liberal, Hays, Pittsburg and throughout the State of Kansas.